In contrast to a direct injection of dc or ac currents in the sample to be tested, the induction of eddy currents by an external excitation coil generates a locally limited current distribution. Since no electrical connection to the sample is required, eddy current NDE is easier to use from a practical point of view, however, the choice of the optimum measurement parameters, like e.g. the excitation frequency, is more critical. Furthermore, the calculation of the current flow in the sample from the measured field distribution tends to be more difficult than in case of a direct current injection. A homogenous field distribution produced by e.g. direct current injection or a sheet inducer  allows one to estimate more easily the defect geometry. However, for the detection of technically relevant cracks, these methods do not seem to be easily applicable and sensitive enough, especially in the case of deep lying and small cracks. 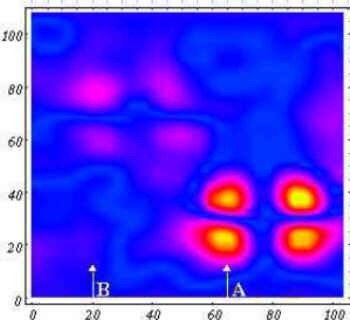 A SQUID  provides two basic advantages for measuring small variations in the magnetic field caused by cracks [3-7]. First, its unsurpassed field sensitivity is independent of frequency and thus dc and ac fields can be measured with an resolution of better than 1pT/ Hz. Secondly, the operation of the SQUID in a flux locked loop can provide a more than sufficient dynamic range of up to 160 dB/(Hz in a shielded environment, and about 140 dB/(Hz in unshielded environment . In this paper we present simulations and measurements of several types of excitation coils, which match the special requirements for a SQUID based eddy current NDE system. We note however that all calculations presented here on penetration depths, current distributions and crack-detecting algorithms are also useful for conventional eddy current testing systems. For each frequency 100 points were taken along a line running from the surface of the conductor into a depth of 30 mm in that region below the coil, where the maximum eddy currents are located (dashed vertical lines in the sketch). These data are fitted by appropriate polynomials to obtain an analytical expression for ( , z) in the frequency and depth interval mentioned above. Figure 2.2 shows the ratio ( , z) between the standard penetration depth 1/ (for the case of a planar incident wave, see Equ. (2.1)) to the penetration depth in case of an excitation coil 1/ C, for different coils and several excitation frequencies. The larger the coil diameter and the depth in the conductor and the higher the frequency, the faster the correction function ( , z) converges to 1, which means that the excitation field is then similar to that of a planar wave. The largest deviations occur in case of a small circular coil when using low frequencies, while the field distribution of a sheet inducer barely differs from that of a planar wave. Only in case of a very low excitation frequency, the finite size of the inducer plate slightly influences the correction function towards higher values. However, it turns out that especially when using a SQUID based NDE system with its low frequencies for the detection of deep lying flaws, the estimation of the excitation frequency from the standard penetration depth 1/ (instead of 1/ C) is not a proper choice. Note that e.g. for a circular excitation coil (R=15 mm) and an excitation frequency of 20 Hz, the real penetration depth is about a factor of four smaller (see Fig. 2.2, left) than what is calculated using Equ. (2.1). Fig 2.2: Correcting function for a real penetration depth, calculated by 3D-FEM for different coils and frequencies. For calculating an optimum excitation frequency one has to consider two facts. First, the eddy current density is damped while penetrating into the conductor (penetration effect). Here the frequency dependence of the penetration depth implies that for deep lying cracks low frequencies must be used for obtaining a sufficient current density in the vicinity of the crack. Secondly, due to the induction law the induced current density at the surface jc0 is diminished when using lower frequencies. Therefore, in total, there is a certain excitation frequency which results in a maximum response field from the crack. We turn now to a discussion of simulations made to easily find this optimum exciation frequency. The simulation of the actual distortion of the eddy current flow caused by a crack turns out to be too time consuming with present means. We therefore have developed a simple model for calculating the optimum excitation frequencies for cracks in different depths of arbitrary test samples: Using Equ. (2.5), we are able to calculate the decrease in eddy current density with increasing depth in the conductor for a given excitation method, taking into account the dependence of the penetration depth c on coil geometry and excitation frequency. For this calculation we have to consider the following facts: First the induced eddy currents at the defect site have to have a sufficient amplitude, controlled by c.
To find now the optimum excitation frequency, we calculate the first derivative of Equ. (3.1) to find the maximum value of the response field Bz of cracks in different depths (Fig. 3.1). 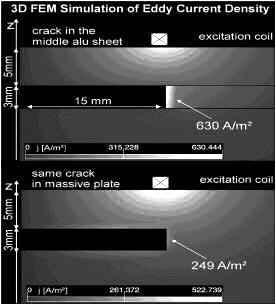 For example a crack (20 x 0.6 x 0.2 mm) in a depth of 9 mm in an aluminium sample ( = 20 MS/m) could be found with highest SNR when using a frequency of 260 Hz. Here a double-D coil was used. For cracks located deeper in the conductor, the optimum excitation frequency moves towards lower values. Fig. 3.1 also shows measured data. 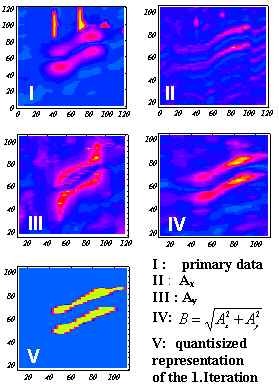 These measured variations of the magnetic field correspond quite reasonable to the data of our model. For higher frequencies there is a disagreement, which we think is due to the small number of nodes in the FEM simulation (30000). For low excitation frequencies of the order of 50 Hz (Fig. 3.1, bottom), a deviation from the theoretical data is found, which is due to the 50 Hz notch filter in our lock-in detector. But this effect has only a small influence on the location of the field maximum. Fig 3.1: Simulated (full line) and measured data for the field variations caused bt cracks, for different excitation frequencies. The size of the crack is 40 x 0.6 x 0.2 mm. Another reason for a deviation between measured and calculated data is the phase shift along the extension of the crack in z-direction. We will discuss this problem in more detail in the following parts. Using Equ. (3.1), we can now compute the optimum frequency for cracks in various depths (see Fig. 3.2). For comparison, the optimum excitation frequency for a planar wave or a sheet inducer (300 x 160 mm) is also displayed. One finds that for a planar excitation source, a much lower excitation frequency is required, which causes a reduction in the response signal of the crack of up to an order of magnitude in case of a small circular coil . Fig 3.2: optimum excitation frequency for cracks in varying depths. The dotted line is for a sheet inducer and the solid one is for a Double-D coil. The indicated points represent the measured values. Equ. (3.1) additionally allows one to estimate the perturbed magnetic field strength for cracks in different depths, although the signals caused by cracks depend on the heights and lengths of the cracks. 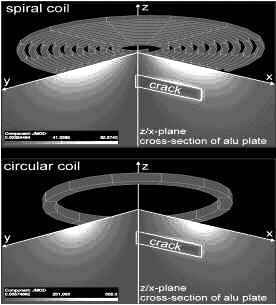 For smaller cracks both, the ratio between eddy current densities with and without cracks , and the mean diameter of the perturbed circular currents are small, which results in a higher attenuation ( flaw >> ) of the response field caused by the crack. Furthermore one has to consider the phase jump effects in case of cracks with an extension in the z-direction. Here the total response of the crack results in the integral over the decreasing amplitude and the changing phase in the z-interval of the defect. For cracks with no extension in the z-direction, one can assume a constant amplitude and phase shift in the vicinity of the defect. Figure 3.3 shows the increasing attenuation for cracks in a depth between 5 and 30 mm, using the optimised excitation frequency for each depth. The coils (circular, double-D) have a current density of 106 A/m². In case of circular and double-D coil, this corresponds to an excitation current of 100 mA and 100 turns. The sheet inducer (300 x 160 x 1 mm) is also driven with 100 mA. The aquivalent magnetic field component Bz on the surface of the conductor is about 220 µTRMS . For a 40 mm long crack ( 3) in a depth of 25 mm, we measured a signal Bz of about 400 pT which results in a damping factor of 1.8 .10-6. The upper curve in Fig. 3.3 represents the attenuation for a double-D coil. Here we find an attenuation factor of 2.5 .10-6. Thus the dynamic range of the measuring system for detecting cracks in a depth between z = 0 and z = 30 mm, depending on the thickness of the test object, must be at least 130 dB. An even higher value is required when using a non optimal excitation frequency. Fortunately it turns out that a SQUID with optimised read out exhibits a dynamic range of at least 140dB/ Hz or even more depending on the environmental noise. In order to realise such a high dynamic range, either a local compensation coil at the location of the SQUID  or a gradiometric excitation coil like the double-D coil have to be used. In case of the electronic compensation, the excitation field and the response of the conducting sample is compensated by a phase shifted current in an additional coil situated close to the SQUID-sensor. Due to the small size of this compensation coil (in our case, the diameter of the coil is about 1 mm), the test object is not affected by it. The geometric compensation by means of a gradiometric coil is realised by placing the SQUID exactly between the two halfs of the coil, in order to detect only the response of the sample. In both cases we could achieve a reduction of the excitation field at the location of the SQUID of up to 1000. Electronic and geometric compensation together leads to an improvement of six orders of magnitude in the dynamic range, compared to a system without excitation field compensation. Fig 4.1: Excitation with spiral (top) or circular (bottom) coil. White color corresponds to a high eddy current density in the sample (9turns, 6mA). Fig 4.2: Cross section of the test object. Comparison between the eddy current density close to a crack in either a massive (bottom) or a stacked sample (top). We have performed some simulations of the eddy current distribution in a test object for a spiral coil and a circular one (see Fig. 4.1). Both coils had 9 turns and the excitation current was 6 mA. Figs. 4.1 show the cross section of the sample at the location of the crack and the amplitude of the eddy current density. One observes a 1.5 higher current density at the sides of the crack for the case of the circular coil. For precise 3D-FEM simulations, a huge number of nodes is required (>30,000), which results in calculation times of several hours (sun sparc 20) for one model. In order to decrease the number of nodes, we took advantage of the symmetry of the coils and calculated only a quarter or half of the test object. The modelled crack has a lenght of 15 mm, a height of 3 mm and is in a depth of 5 mm. The excitation frequency was 200 Hz. In reality, aircraft parts can consist of several stacked layers of material, connected by rivets or bolts. To avoid corrosion, the layers are often protected by a special coating, so that there is no electrical connection between the layers. If there is a crack for example in the middle layer, no current will thus flow above or below the defect because of the insulating coating between the layers. There is only the possibility for the current to flow around the crack in the x-y plane, which results in a higher response from the crack as compared to the case of a massive (non-layered) sample (see Fig. 4.2). This can nicely be seen in the simulations (see Fig. 4.2), where the crack in the middle sheet generated a 2.5 times higher eddy current flow than in case of the same crack in a massive sample. For comparison we performed some measurements on two artificial cracks, one was a sawcut penetrating the complete plate and the other a sawcut which left 20% of the material standing (see Fig. 4.3). Fig. 4.3 (left) shows the measured z-component of the magnetic field. The field distribution above the test sample shows a 2.5 times higher field strength in case of the crack which was cut completely through the plate. In the left part of Fig. 4.3 a line scan is shown for comparison of the amplitudes of both cracks. A three times higher signal can be seen in case of the sawcut entirely passing through the plate. For an exact comparison we have to take into account that the left crack has only a height of 1.28 mm instead of the 1.6 mm of the right crack, which results in an effective amplitude ratio of 2.4, an excellent aggrement to our simulations. Fig 4.3: A-scan of the field variation above the test sample. Fig 4.3: Test sample with different sawcuts. Right below: line scan at positions indicated by white arrows. Fig. 5.1: Iterative algorithm for easier detection of cracks. (I: A-scan of a crack in a depth of 15 mm, 0° tilting, I - V: white color: above threshold, dark color: below threshold ). Fig. 5.2: Algorithm for extracting the response of the crack in the presence of interfering signals. The crack is in a depth of 5 mm, it is 40 mm long and rotated by 30° with respect to the x-axis. For an easy interpretation of the measured data, additional tools for improving the quality (e.g. the signal to noise ratio) of the displayed magnetic fields are desirable. For example bandpass filters of suitable bandwidth can prevent signals of small defects from being hidden in a slowly varying background field, caused e.g. by a varying distance between coil and sample. Additionally, spurious signals sometimes occur, which are due to offset variations, edge effects, variations in conductivity etc. For an industrial application it is necessary to separate the response of a real crack from artifacts, and to derive information about the geometry and the location of the crack. For this purpose we have developed a filter which is sensitive to the characteristic features of a signal caused by a crack and amplifies it, whereas signals without these typical features are suppressed. In Fig. 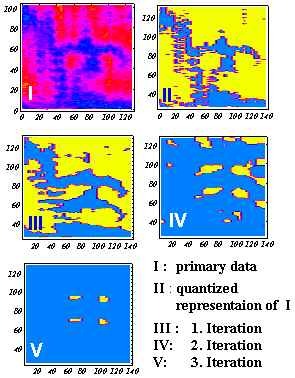 5.1 first results obtained with such an iterative filter algorithm are shown. 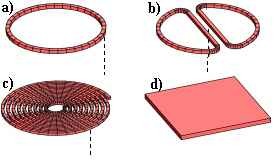 For the case of a double-D coil we multiply each matrix element with an element shifted by a constant distance of the same line. This is done in x- and y-direction. The distance between the two elements is the correlation length for filtering in x-direction and a second correlation length for the movement in y-direction. Thus one gets two new matrices Ax+ and Ax- for the filtering from the left to the right (positiv x-direction) and vice versa (negativ x-direction). In case of a gradiometric excitation with a double-D coil, this algorithm enhances the response of the crack, while other signals like artificial peaks and plateaus are supressed. The calculation can be done using different correlation lengths in order to obtain additional information about the depth in which the crack is located. By choosing the proper correlation algorithm, it is possible to realise sensitive filters for other types of defects (e.g. corrosion). Fig. 5.2 shows an example for the suppression of signals which do not exhibit the expected defect structure (Two parallel white lines near upper central rim portion of Fig. 5.2). The largest improvement in SNR is obtained here by using the expression (ai. ai+ /ai+ /2), since for a gradiometric excitation, one expects the crack response to show two maxima (ai , ai+ with a minimum (ai+ /2) in the centre (see Fig. 5.3). The authors are grateful to F.Schur, W.B.Klemmt, Alexei Kuntewich and V.Vengrinowich for helpful discussions. S. Tan, N. Sepulveda, and J.P. Wikswo, Jr., J. Comp. Physics, 122: 150-164 (1995). D.Koelle, R.Kleiner, F.Ludwig, G.Dantsker and J.Clarke, Rev.Mod.Phys (to be published). R.Hohmann, H. -J.Krause, H. Soltner, Y. Zhang, C.A.Copetti, H.Bousack and A.I.Braginski, IEEE Trans. Appl. Supercond., 7, 3702, 1997. Cochran, J.C.Macfarlane, L.N.C.Morgan, J.Kuznik, R.Weston, L.Hao, R.M.Bowman and G.B.Donaldson, IEEE Trans.Appl.Supercond. AS-4, 128 (1994). M.v.Kreutzbruck, J.Tröll,M.Mück, C.Heiden and Y. Zhang, IEEE Trans. Appl. Supercond., 7, 3279, (1997). F. Schmidl, S.Wunderlich, L. Dörrer and P. Seidel, IEEE Trans. Appl. Supercond., 7, 2756, 1997.